Traian Vuia (Romanian pronunciation: [traˈjan ˈvuja]; August 17, 1872 - September 3, 1950) was a Romanian inventor and aviation pioneer who designed, built and flew an early aircraft. His first flight traveled about 12 m (40 feet) at Montesson, France on March 18, 1906. This was the first well-documented unassisted takeoff and landing on a level surface by an engine-driven monoplane with a wheeled undercarriage. After graduating from high-school in Lugoj, Banat, Romania in 1892, he enrolled in the School of Mechanics at the Polytechnic University of Budapest where he received his engineering diploma. He then joined the Faculty of Law in Budapest - Hungary, where he earned a Ph.D. in law in May 1901 with the thesis "Military and Industry, State and Contract regime". The problem of flight with a machine which weighs more than air can not be solved and it is only a dream. By December 1905 Vuia finished construction of his first aircraft, the "Traian Vuia, 1" a high-wing monoplane powered by a carbonic acid gas engine. The liquid carbon dioxide was vaporized in a serpollet boiler, this added heating of the working fluid gave the engine a duration of about three minutes. He chose a site in Montesson, near Paris for testing. At first he used the machine only as a car, without the wings mounted, so he could gather experience driving it. On March 18, 1906 he made his first flight attempt. After accelerating about 50 meters, the plane left the soil and flew about one meter high for about 12 meters distance, then landed. 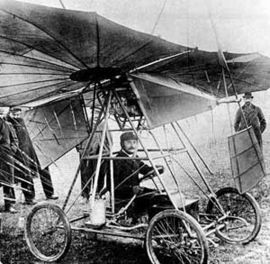 The British aviation historian Charles Harvard Gibbs-Smith described it as "the first man-carrying monoplane of basically modern configuration", and "unsuccessful"
Vuia said he made his first flight on March 18, 1906 in the presence of his mechanic and two close personal friends. Accounts of this flight published at the time, and of his later flight of September 1906, are based on letters he personally wrote to L’A�rophile, the official journal of the A�ro Club of France.. Another journal of the period, Flight magazine, credited him with a flight of five meters on October 8, 1906, as the earliest entry in a list of his flights shown in a table of "the performances which have been made" by a number of aviation pioneers. Timişoara International Airport Traian Vuia (TSR), Romania's second largest airport, carries his name. Orna, Bernard (30 March 1956). "Modest Experimenter - Vuias Powered Flights: the Successes of a Little-known Pioneer". Flight. http://www.flightglobal.com/pdfarchive/view/1956/1956%20-%200368.html.